Click to enhance this panorama stitched together by Google Photo from my iPhone pics shot while running 201km and climbing 11,440m. It's hard to slow down when everything goes perfectly. My main goal for 2015 was Swiss Irontrail (SIT) T201: both my longest (201km/125 miles) ultratrail race, the one with most climbing (D+ 11,440m/37,533ft and the same amount D-). Their slogan Beyond the limit is right on. 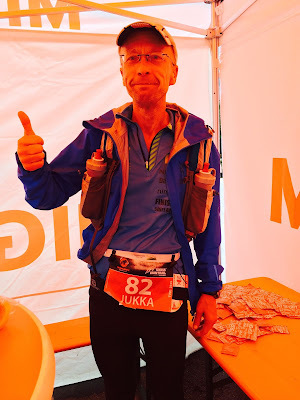 I participated in Transgrancanaria (43km DNF), Ecotrail Oslo 80km, Lavaredo Ultra Trail (95km DNF) and Zugspitz Vertical Challenge 16km as training races. Things rarely happen exactly as planned, but if you just keep going the end result can still be achieved. 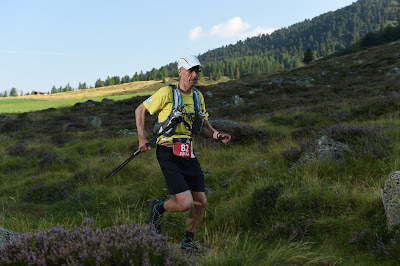 My priorities were 1) to stay healthy and uninjured, 2) to do more vert up/down training in June-July than ever before, and 3) to taper really well the last weeks before the race on August 13-15. Running flat miles wasn't important. Also finishing those training races wasn't necessary. The only thing that mattered was focusing on finishing SIT. I arrived in Davos on Wednesday afternoon. The start was 8am next morning. I got my bib and GPS tracker, packed my Ultimate Direction PB Adventure Vest 2.0 as well as two drop bags provided. The weather forecast predicted sunny until Friday noon, and from then on rain with possible thunderstorms. I packed an extra Haglöfs Gram Comp Gore-Tex jacket in my second drop bag with Hoka Stinson ATR shoes just in case. The best weather ever on Thursday! Photo by Roger Molleman. 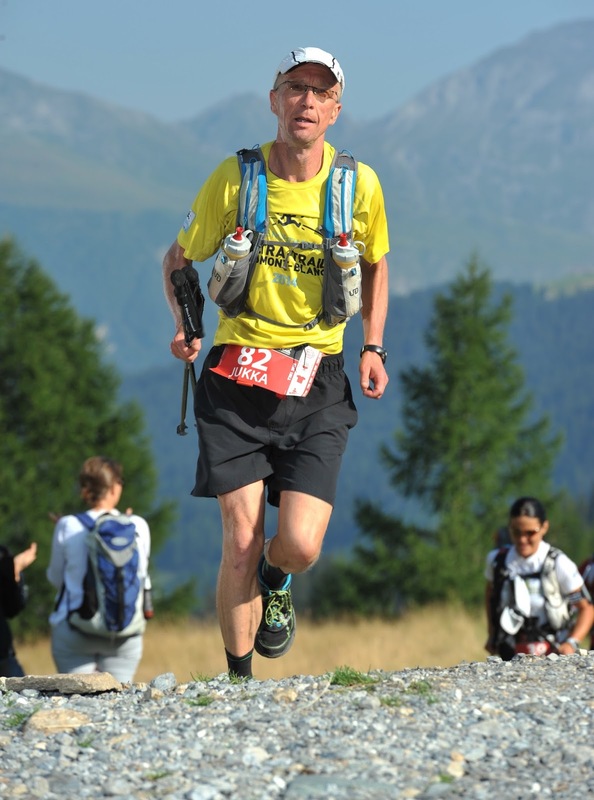 I planned to start with Hoka Challenger ATR shoes, shorts, a t-shirt, a cap and Black Diamond carbon Z-poles. The food/beverage plan provided by the organizers seemed excellent, so I just carried my front bottles, a few salt caps and some caffeine gels for emergencies between stations. The sunny trail to Sertigpass. The dawn in Davos (1558m) was ideal as expected. 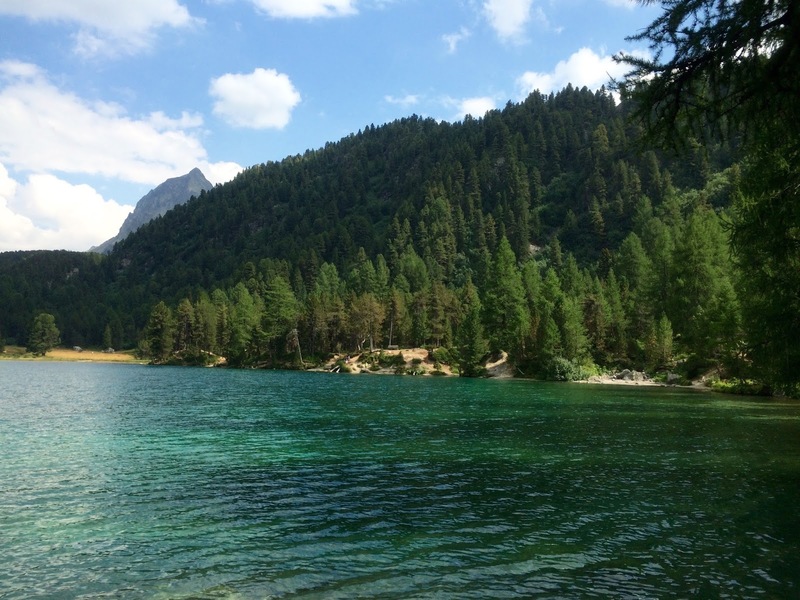 I dropped my bags for Samedan (55km) and Savognin (135km), turned on the GPS tracker, and strolled to the start area at Promenade. 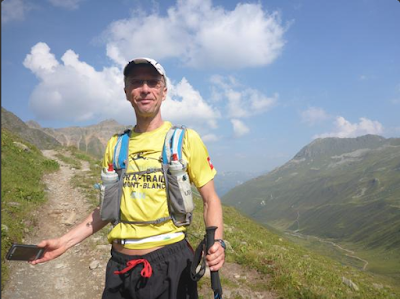 I chatted with Christof Teuscher (who would finish 5th and the best non-European). At 8 o'clock the gun went off. 185 runners started for 201km. It would have been really easy to run much faster with the others, but I held back big time. 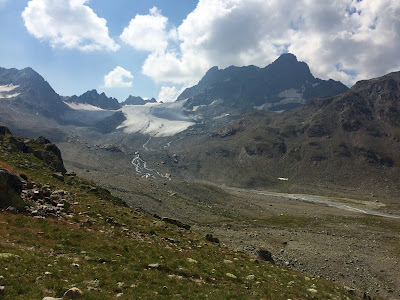 I have run this trail to Sertigpass via Eggen, Sertig Dörfli and Grüensee before and knew it would be wise to save energy. Roger the Swiss trail machine. I chatted with a Swiss Gigathlon finisher Roger. It turned out we are both a bit of multisport aficionados. For example we both have read Bennie Lindberg's book 'Bis Zum Äussersten'. Anyway, we shared a similar conservative strategy and ended up running more or less together the whole course since then. Roger was crewed by his sister. I had no crew or anything as usual. 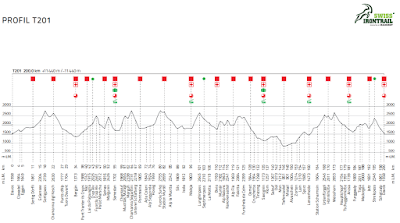 I didn't even bother to wear my old Ambit1, but Roger managed to track the whole circuit with his new Ambit3 Peak. 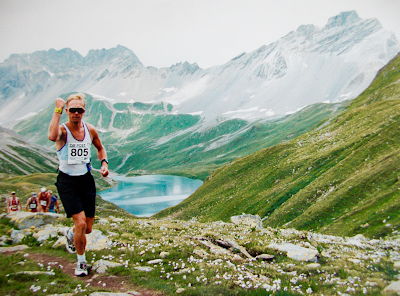 Me at Sertigpass in my first Swiss Alpine Marathon in 1995 (67km). It was fun to run on such a gorgeous day. Soon I was admiring the views on top of Sertigpass (2739m, 18km). After a short jog we enjoyed the first meal of the race - awesome Himalaya Vegetable Bouillon and bread with bananas - at Kesch hütte (2630m, 22km). Me at Sertigpass in Swiss Irontrail 2015 8201 km). Photo: Roger Molleman. Then it was my favorite downhill via Punts d'Alp and Tuors Davant to Bergün (1373m, 34km). It started to feel pretty hot, but the super easy pace and ice-cold water from Alpine streams kept things under control. After 5h17min we arrived in Bergün CP. We were already 3h38min under the cutoff. My ranking was 76 in men overall. I stuffed watermelon slices in my mouth and washed it down with Coke. Ready to go! 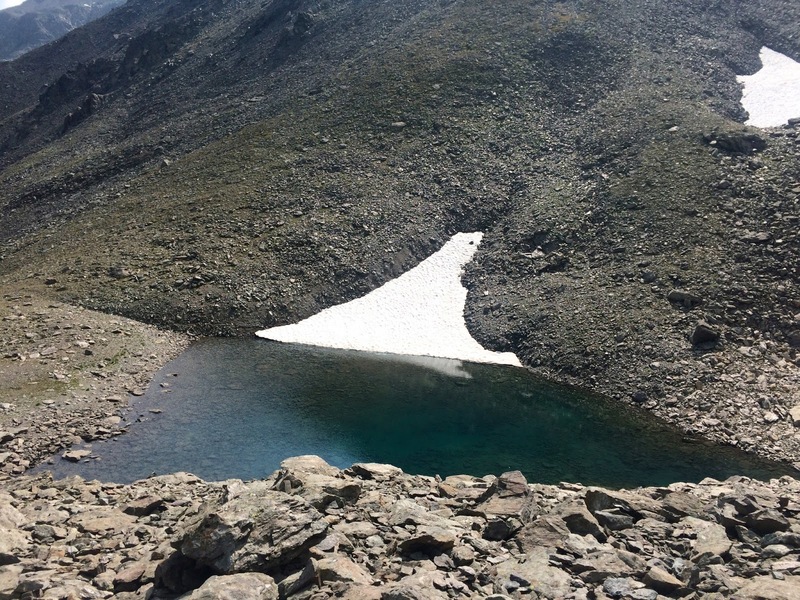 The glaciers and lakes seem to be getting smaller due to hotter summers. 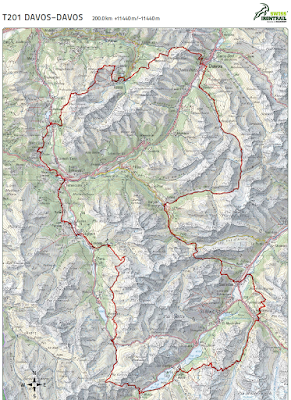 The following double-peak section would be challenging but beautiful. First we climbed to Naz (1747m, 40km - only 100 miles to go!) where I had my first but not last warm meal of pasta and tomato sauce. Then it was a scenic trailrun to Lai da Palpuogna (1915m, 42km) via Punt Tranter. 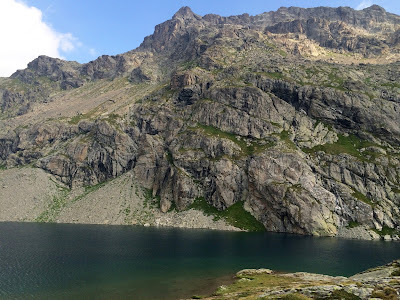 This mountain lake would have been a fantastic place for a picnic, but we continued up to fabulous Fuorcla Crap Alv (2461m, 46km). About half-way up I encountered Becky Nixon wandering around, having lost the trail for a while. She was one of the top women (she would finish 6th) and I was happy to show her the way up. It was an incredible technical section - stunning and steep. The course was well marked, but in this kind of terrain it's still easy to lose the right track. On the top an amazing downhill opened up. Becky let out a wild scream and revealed the downhill demon inside her. 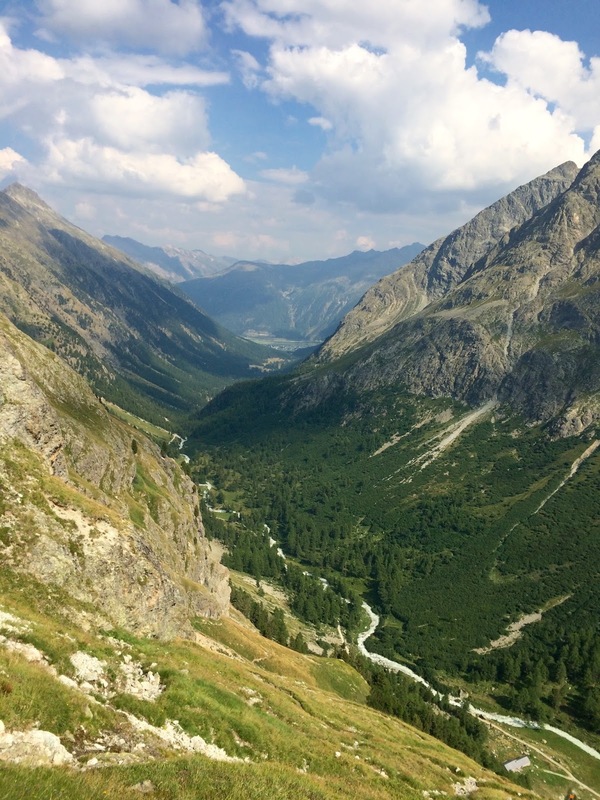 We spent some time taking photos with Roger and saw her tiny figure run far down below in the valley of Palüd Marscha. 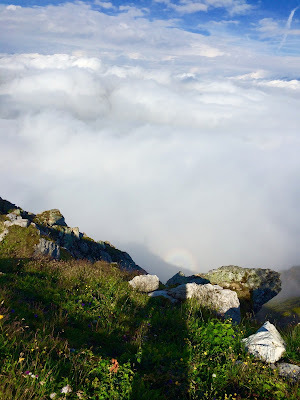 I felt comfortable above 2500 meters, despite arriving only the afternoon before. While approaching Spinas Aid Station a last year's T201 finisher told us they had they had been told to take a detour around this downhill because it wasn't safe enough in rain. Suddenly I saw something shaped like a tree root moving on the trail. I thought it was unusual to have a hallucination this early in the race and in broad daylight, but then the others saw it too. It was a real snake. 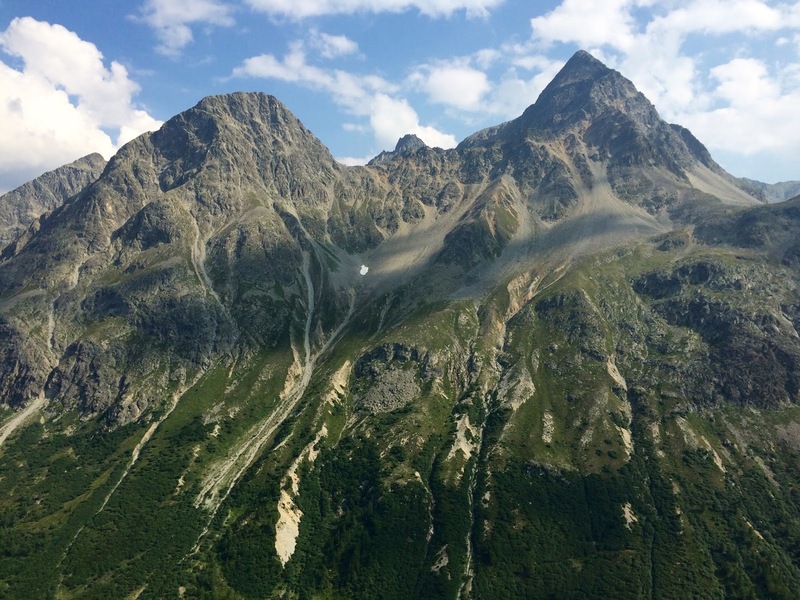 We loaded some energy at the AS for ascending Margunin (2426m) and descending to Samedan (1702m, 55km). We reached this big CP with our first drop bags in 10h53min. It was already 18:53, but the cutoff was 23:50 so we had plenty of time to take a break. View to Piz Kesch in south beyond where we would be heading later. I changed all my clothes and had a great dinner consisting of pasta, tomato sauce, bouillon, bread, boiled salty potatoes, chocolate cake and coffee. "You are a crazy downhill runner", I told Becky. "You are a crazy uphill runner", she replied instantly without missing a bite from the food mountain on her dinner plate. There were mattresses for those who required a little nap, but we decided to push on further with Roger before the sunset. Lake Palpuogna after about a marathon 42km. Me navigating up Fuorcla Crap Alv with Becky Nixon following. 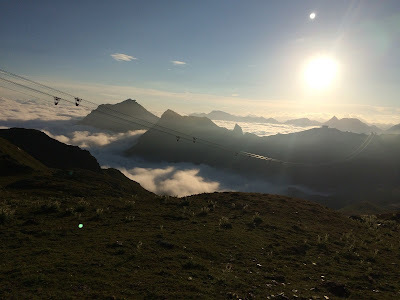 The climb up to Muottas Muragl (2454m, 61km) went well in the last rays of daylight. 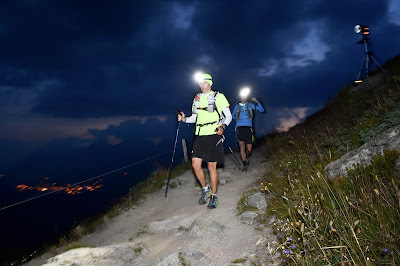 As the night fell, we lit up our headlights and ran the easy descent to Margun (2338m). 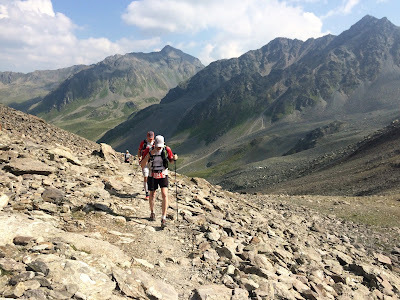 On the way up to Chamanna Segantini (2731m, 64km) I suddenly lost all power and had to stop for a Enervit Caffeine gels and sports drink, a B-vitamin complex and a salt cap . This was definitely a dark moment for me, but a similar situation has happened before in other races and I've learned how to automatically reboot my system a bit like a Terminator or something. Roger climbing up to Fuorcla Crap Alv. Roger had continued without noticing my serious troubles straight up to the top and waited for me in a hut there. 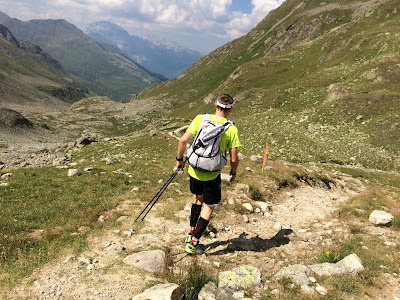 I passed the hut in darkness without seeing him, but luckily he spotted me plodding ahead and after some discussion we arrived in Pontresina (1805m, 69km) CP together in 15h15min. 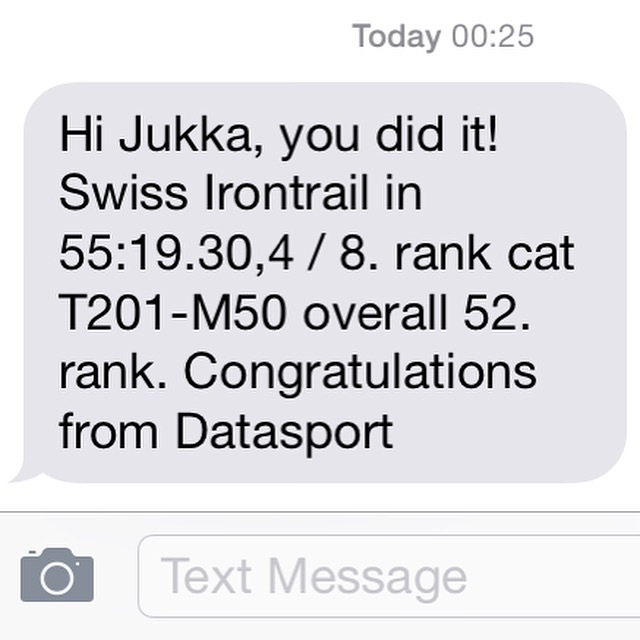 It was 23:15, I was feeling good again, and the cutoff wasn't until 4:50am on Friday. 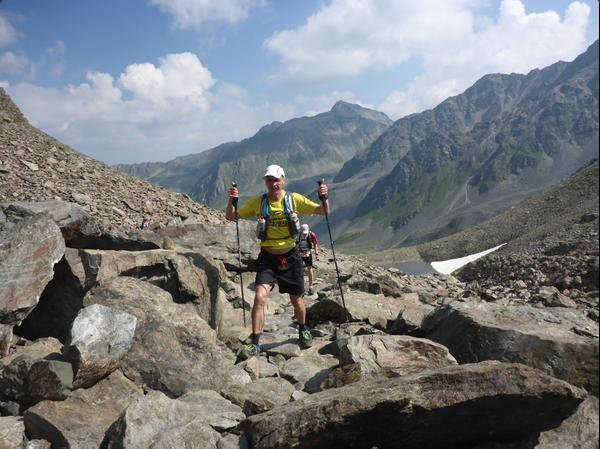 We attacked straight away the highest point of the course, Fuorcla Surlej (2755m, 80km). We could see the red lights at the top, but the problem was they didn't seem to get any nearer. The mountain just went on and on. 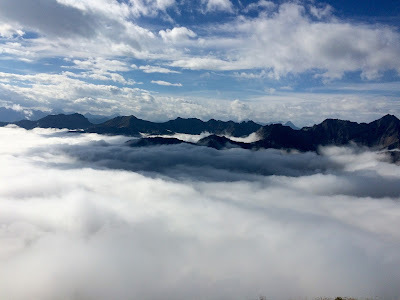 There was nothing to see there in the middle of the night, so we hurried to the welcome warm shelter of Murtèl cable car station (2699m, 82km). After eating there it was mostly downhill to Sils (1809m, 89km) and then relatively flat route by the Lake Silsersee to Maloja (1803m, 96km) CP. It took us forever to get there, or 22h54min to be precise. It was dawn of a cloudy Friday, 6:54am. It was nice to meet Race Director Andrea Tuffli and his son (who was in the T201 race with us) Jon Andrea Tuffli there as well. We had an awesome rejuvenating breakfast with coffee and cake together and headed out. 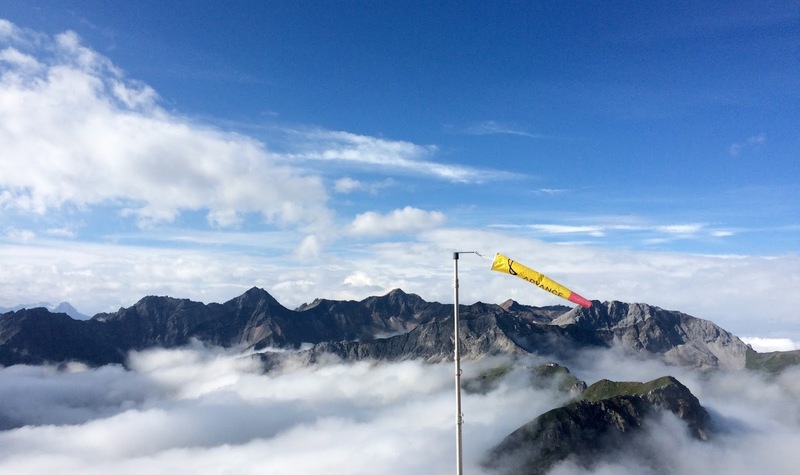 The morning weather was nice, although Lunghinpass (2645m, 101km) was windy. 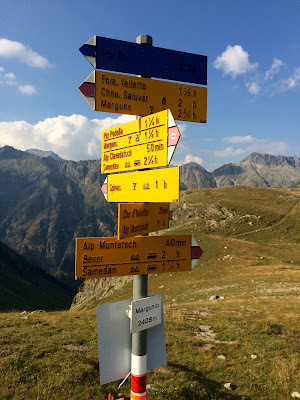 We hurried to Septimerpass and then down to the next AS in Bivio (1769m, 110km). It was hot as hell there and I asked the guy at the computer to check out the latest weather forecast for this area. He said there is a thunderstorm warning, and the bad weather could start anytime now. We hit the steep uphill to Murtér (2181m, 112km) at noon. The amazing downhill to Palüd Marscha and Spinas. A few minutes later there was thunder and it started to rain gradually. I hid under a big hollow rock and put my rain gear on. 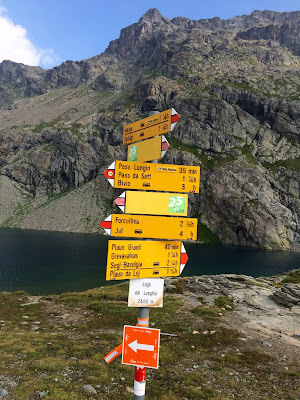 There were some lightnings but it was ok to continue the rollercoaster route down to Alp Natons (1963m, 114km), up Kanonensattel (2241m, 116km), down Alp Flix (1969, 119km), and up Furschela da Colm (2399m, 125km). We ran fast considering how wet and muddy it was everywhere. RD Tuffli obviously waiting for his son greeted us in the pouring rain and wind: "How are you feeling now?" - "We love the rain!" I shouted and gave him a thumbs up sign. Preparing for the downhill to Palüd Marscha. It was a miracle that I didn't fall once, as there certainly were opportunities for that. On the final long downhill to Savognin (1173m, 135km) CP the weather cleared for a brief sunny spell. We arrived there tired and muddy in 34h58min, 18:58 on Friday evening. My ranking was 63 in men overall. 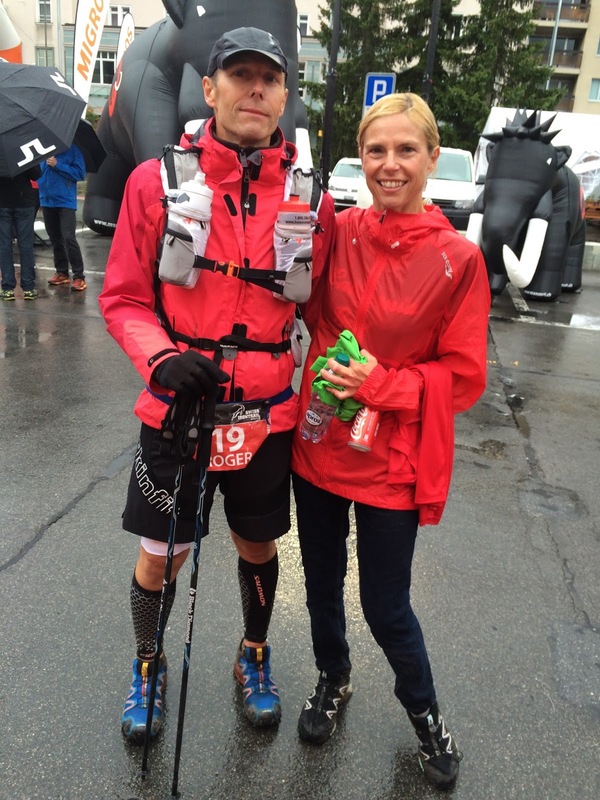 By then the winners had already happily finished in Davos: Ramon Casanovas in 34:20:34 and Andrea Huser for the women with 34:53:36. We agreed to have only a 80-90 min break in Savognin, although the cutoff there wasn't until 2:15am on Saturday night. I went downstairs to the shower rooms to change all clothes again. When I washed my feet I didn't know if I should laugh or cry. I reapplied NOK anti-blister creme, put on clean dry socks and Hoka Stinson ATR shoes, and hoped for the best. I ate as much as possible, put on my Gore-Tex jacket and changed the batteries of my Silva Trail Runner headlight. If you wanted to stop in Savognin you would get the same 4 UTMB points credit as finishers of full 201km in Davos, but not the T201 Finisher t-shirt. Many accepted this generous deal and half of the field chose to DNF. We certainly not going to stop now - not even for a nap! We started the long dark wet march with Peter from Sweden, who had kindly decided to join our team. RD Tuffli was there again to wish us good luck. 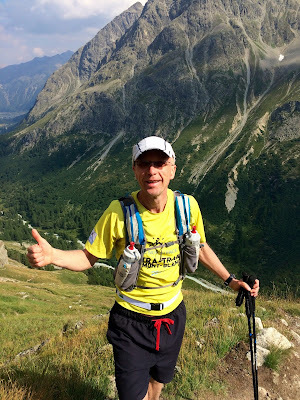 Roger and me running by night to Pontresina. The way to Lunghin Pass. "This trail seems much different from the previous trails", Peter observed. I agreed, as in darkness all the shapes and forms on the ground shifted into various hallucinations. I knew they weren't real, but it slowed me down. Actually the little black lizards were real - or at least the others saw them too. 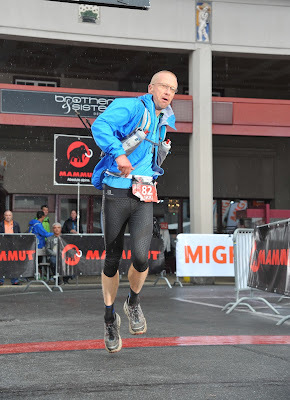 The downhill was quite steep in some places and the trail was slippery in the rain - at least with my Hoka Stinsons. Challengers would have been much more suitable shoes for this, but my only pair was left full of mud and dirt in my drop bag in Savognin. It occurred to me that falling down would not be a good idea now, and held back considerably. Right then I slipped and slided on my bum, but managed to fall on the safe mountain side. I felt an adrenaline rush and continued even more carefully if possible. We reached the lowest point of the course in Tiefencastel (851m, 146km) and enjoyed some coffee and cake there. 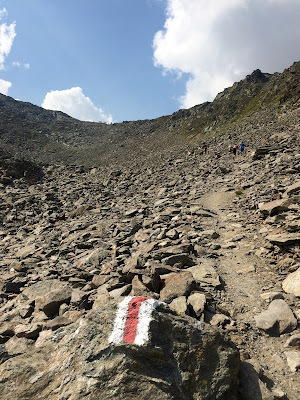 When we walked up the most boring asphalt road to Sporz (1585m, 157km) I felt very sleepy all the time and found it challenging to go straight and stay on the road. At the top we found it hard to figure out where the route goes, although we did see some markings here and there in the dark cold drizzle. I guess we weren't the sharpest tools in the shed at the moment. Certainly I was a few fries short of a Happy Meal. Although constantly gulping down caffeine gels with sports drink, I barely was able to put one foot in front of the other. After a few hits and misses we finally ended up inside the bright warmth of Lenzerheide (1473m, 160km) CP in 42h51min. 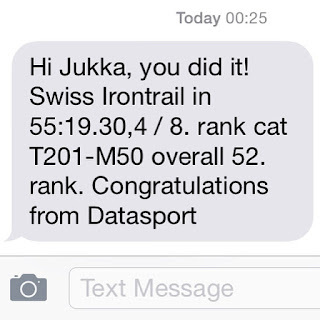 It was 2:51am on Saturday, I had less than a marathon to go, and I was on 59th position in men overall. When you climb high enough, there might be blue sky above the rain! I proceeded to eat and drink pretty much everything available. They also had a first aid service, so I asked about the pain in my left forefoot. The guy asked me to remove my shoe and shock to examine it. He said I had a big blister there, but the best he could do was to cut a round flat shape from a soft material and tape it around the blister. That provided the extra cushioning required to get the job done. I have never popped painkillers and wasn't going to start now, as I plan to rely on my old pair of kidneys in many future races. Climbing Weisshorn above the clouds. I hit the road again with Roger and Peter. It was steep climbing for a change, but we refused to give up. By Saturday dawn we somehow found ourselves in Urdenfürggli (2546m, 168km). I felt freezing cold and was glad to see the sun climb up in the clear blue sky. After a short jog we arrived at Hörnlihütte AS (2511m, 170km). While we enjoyed our breakfast there the whole valley was covered in thick fog and clouds. I started towards Weisshorn with Roger and Peter. The path was well marked as usual and I found it easy to follow even with the poor visibility. Suddenly the guys ran in the wrong direction uphill, apparently thinking they were lost. I went after them trying to find out what's the matter. Roger was already way too far to hear me, but Peter looked back at me and asked if I had seen any course markings. I told him yes, I had seen the markings so this was the wrong way. Obviously failing to pay any attention, Peter disappeared into the fog after Roger. I rolled my eyes and thought whatever, let those exhausted minds wander around - they'll find their way. I had a race to finish and no more time to waste. I returned to the right track which was soon confirmed by a fellow runner and a few more markings. I felt really strong and decided to fire on all cylinders. Weisshorn view above the clouds. I climbed the steep long ridge up when I heard someone shouting and waving at the top of the mountain. When I got closer I realized they were Roger's sister and wife. I'm sure Roger had called them to tell he was coming slightly behind me, because they cheered at me and weren't worried about the whereabouts of the guys. 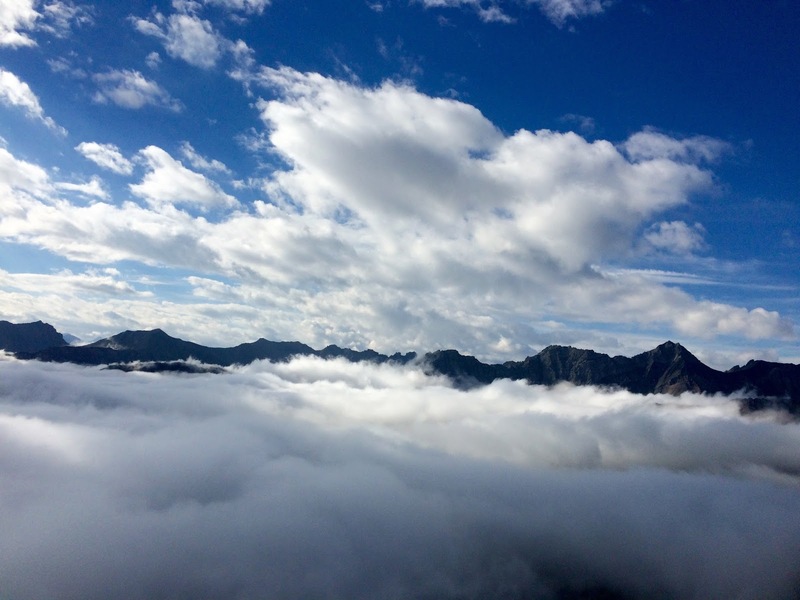 I shot some pics above the clouds on top of Weisshorn (2653m, 173km). I helped another competitor take a photo of himself. 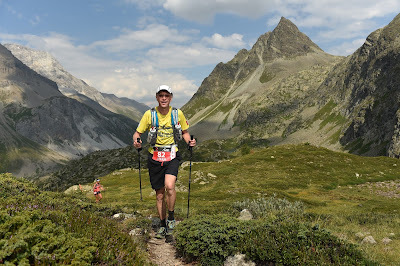 He told me his legs were in bad shape, but he had done the race also last year and knew that it was fast runnable trail all the way down to Arosa. I took his advice and said I was going for it. "Enjoy! ", he shouted after me. 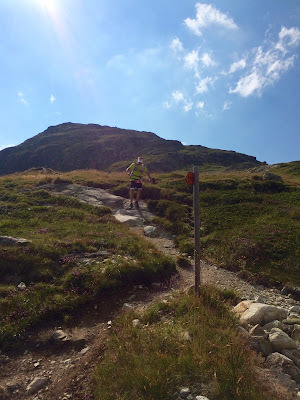 I ran inside the last CP in Arosa (1739m, 181km) in 50h43min in 55th place. It was 10:43am on Saturday morning and I was about seven hours ahead of the cutoff. I enjoyed my last meal of pasta, tomato sauce, salted potatoes and coke there and hurried out like I stole something. 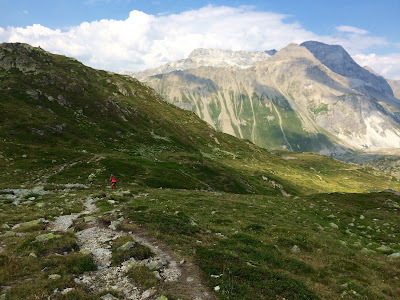 I still had 20K of trailrunning left in unstable weather and the last mountain to climb, but considering what I had gone through I felt nothing could stop me reaching Davos. It really cheered me up and warmed my heart how almost every competitor in other races (T121, T91 and T41) congratulated me as they passed. 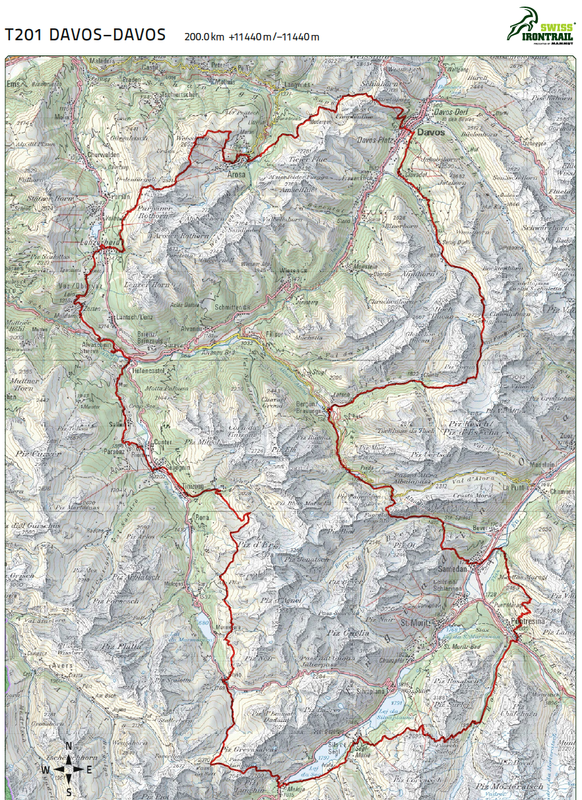 Soon I was in Tieja (2011m, 187km) and Medergen (2000m, 188km). 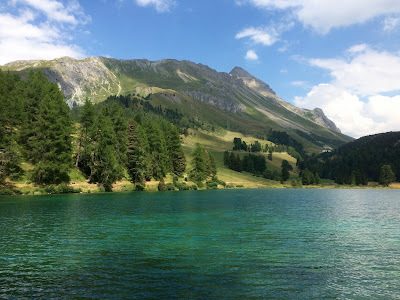 It started to rain again on my way down to the last AS in Jatz (1831m, 192km). I enjoyed some more coke and cake to keep the fire burning for a bit longer. Crossing the finish line in Davos. The last uphill section seemed to take me forever. There were loose rocks, streams to cross, wind and rain, and I experienced some trouble with every single obstacle. I felt like everyone and their mother was passing me. 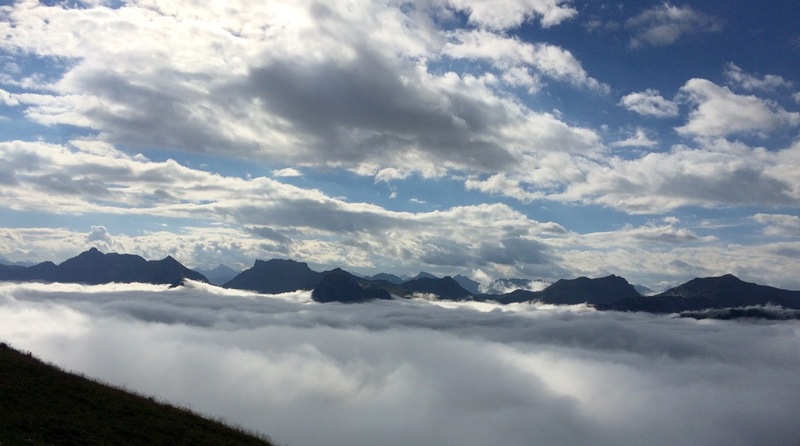 Finally I reached the top of Strelapass (2346m, 195km). 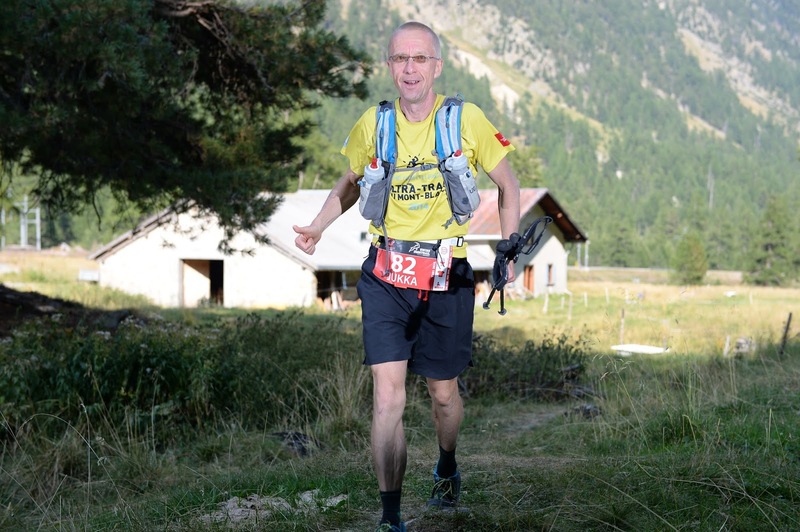 About 5km downhill was the only thing between me and the finish line. 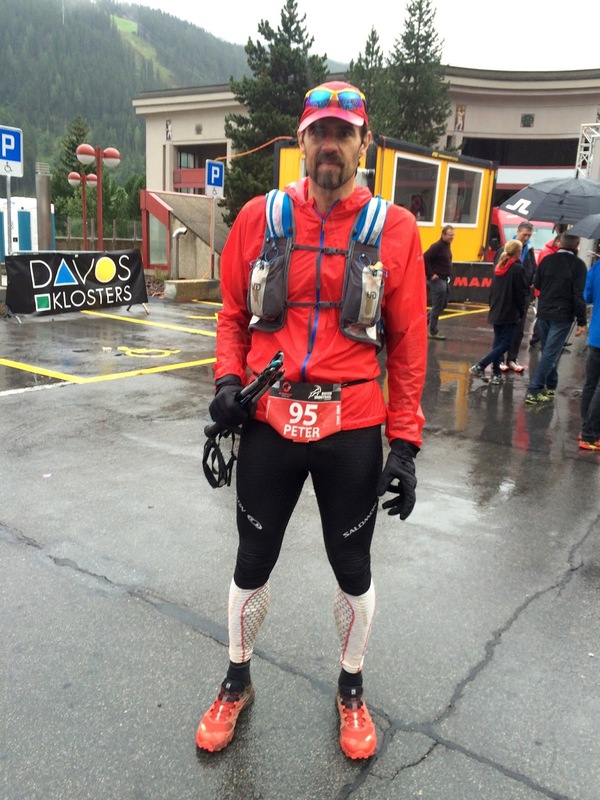 Peter at the finish in Davos. I picked up speed but when I stepped on a rock the painful blister that had been bothering me exploded. They must have heard my scream in Davos. It hurt a lot, but I decided to pick up speed in the pain cave instead of stopping and feeling sorry for myself. Higher cadence actually seemed to ease the pain, so I kept on accelerating. I realized that I was now passing runners of shorter distances, some of whom had passed me earlier. I passed hikers, I passed families, I passed people with dogs and I kept going faster. I ran through Schatzalp (1861m, 198km) and kept on passing people while shouting warnings to avoid collisions. Roger and his sister at the finish in Davos. I flew down the familiar cobblestone paths to the Promenade, run around the corner and jumped across the finish line in 55:19:30, 52nd in men overall. It was 15:19 on Saturday afternoon. I was ranked 8th in my age group M50. 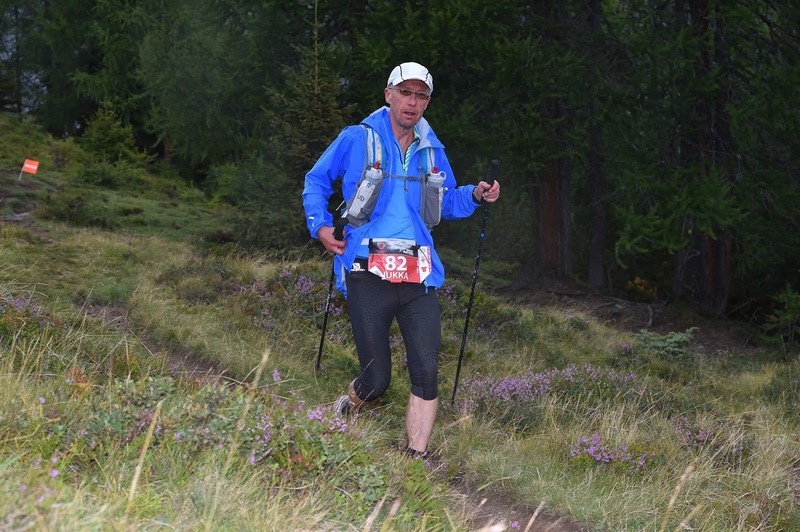 I later learned to my ashtonishment that I had ran the last 20K Arosa-Davos in 4h36min, which was 12th overall including all men and women. Needless to say I was very happy with this result. Before the race I had wondered if I could finish before the 64 hour overall cutoff, but in the end I had a nice 8h40min margin. The reception in rainy Davos was warm, cheerful, efficient and professional, just like at every other Aid Station and Control point. I'm really impressed with SIT race management, organisation, staff and volunteers. The food was easily the best that I've been served in any race. Everything worked so perfectly I wouldn't hesitate to give this event 10/10 points. I'll recommend Swiss Irontrail for every ultratrailrunner, but remember that it's very hard. I think SIT is the Hardrock of Europe. 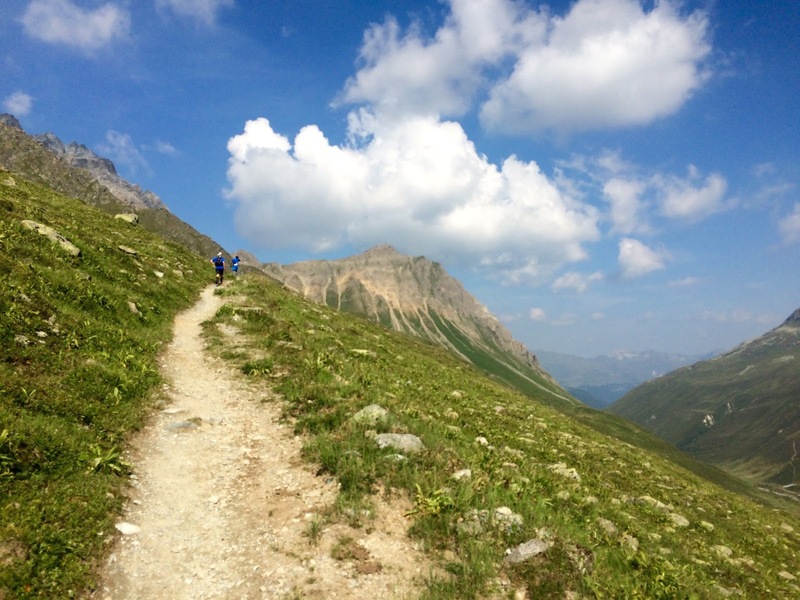 In SIT there is more space on the trails to run freely without crowds or over-commercialization. There are lots of starting places available without a lottery. Medical Certificates are not required. The only negative thing was that a free train ticket to/from Davos wasn't included like in previous years. Hopefully they can work this detail out in the future. I'd sure like to do this race again. It was the perfect race for me. TP, reading your recap was so much fun!!! I don't have a map of the course but will read it again with the gpx on our tv display to get a better sense of what happened where. It's really unbelievable that you did it all in one shot without any sleep. Congrats again for this awesome achievement!!! Thanks Paul! Yes what an amazing adventure it was. 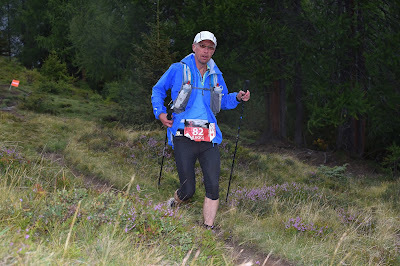 I used to think Ray Zahab was joking when he said "90 per cent of ultrarunning is mental and the rest is in your head", but this race made me realize it actually is exactly like that. Hi there! 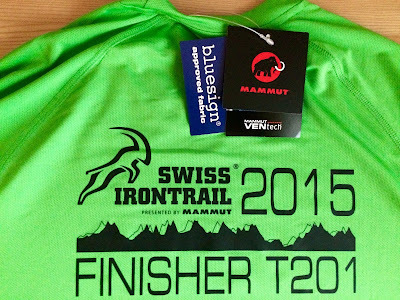 Congratulations and thanks for this great race report! 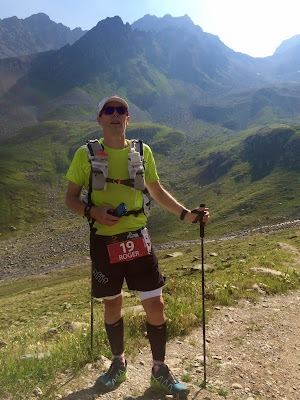 I'm planning on giving this race a try next year, and there's not a whole lot of information on it anywhere, so I'm very grateful you took the time to share your experience. :) Good luck on your future races! Thanks! You should definitely try it! Hi Trailplodder! 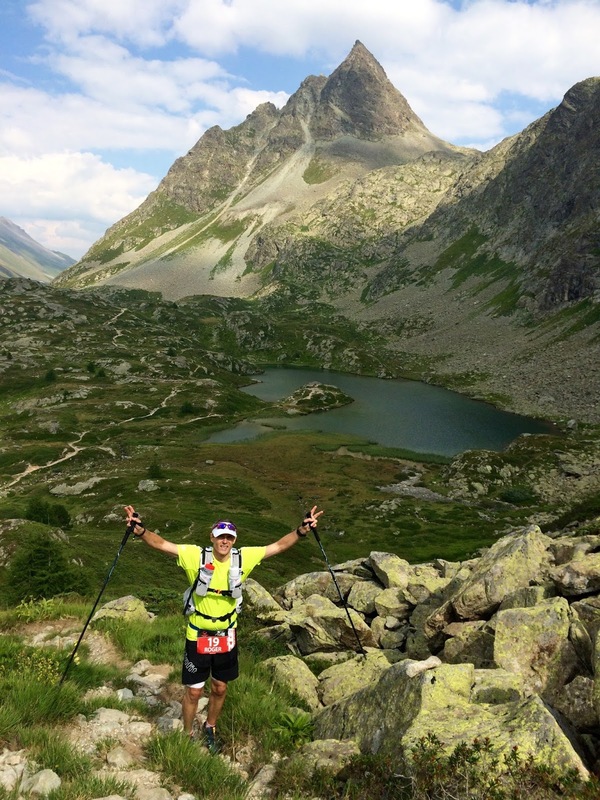 It is really great to read your story from Swiss Irontrail! I ran the much shorter 41K version and I´m hoping to return again in 2016. 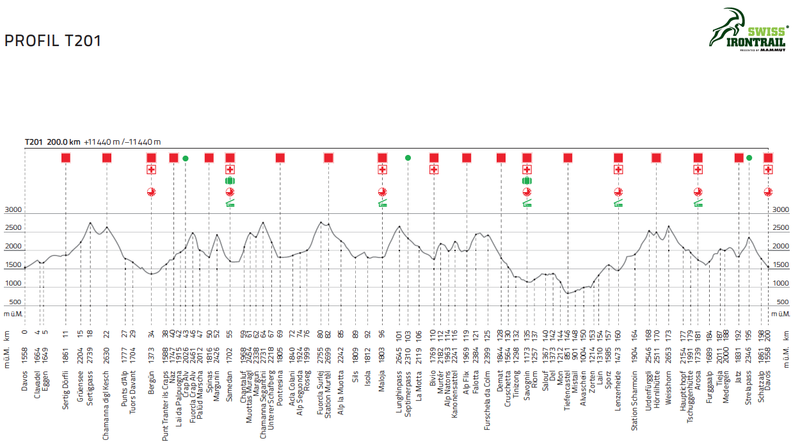 I have not yet decided which course, but it seems if you sign up for 201 you have the option to DNF after 99 and 135 km. I would very much like to know how far I can walk/run. In my earlier outings I have found that quote by Ray Zahab to be true! Good luck and I wish you a very Merry Christmas! Thanks Peppe! I've already signed up for T201/2016. You should follow my example. It's a lot of fun. This 200km is the best deal ever for sure. I know they have arranged these options for DNF, but to really go all the way your attitude has to be that quitting is not an option. Good luck and Merry Christmas! Thanks a lot for this post. It is a great read. I am going to run the T201 this year. Thanks, you are welcome! 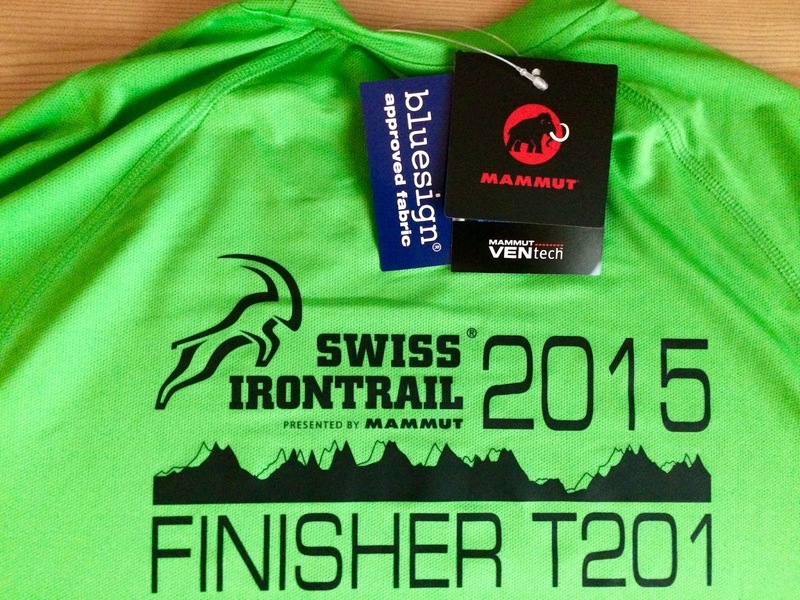 I'll run T201 again this year, so see you in Davos in August! Thanks for the nice story! I will run the race this year, in a week from now, and was looking for a detailed description of the course. This was just what I needed! Thanks for reading Mihai and good luck for the race!